A Kadam, M Ganachari, B Mahendra Kumar, S Gurunath. Drug Induced Tooth Discolouration. The Internet Journal of Dental Science. 2008 Volume 7 Number 2. It is essential that every health care professional who is Involved with the prescription or recommendation of drugs be fully aware of any resultant disorders that may arise as a side-effect. A range of drugs can affect the teeth. In this Review article, drugs that have the potential to induce tooth discoloration (intrinsic and extrinsic), Pathophysiology Mechanism and Treatment. Bright white teeth are highly regarded and sought after in today’s society. Consumers invest a lot of money on cosmetic dentistry and in commercial products that promise an aesthetically pleasing smile. It follows that consumers should want to avoid or limit exposure to materials that contribute to the discolouration of teeth. There has been a recent increase in interest in the treatment of tooth staining and discolouration as shown by the large number of tooth whitening agents appearing on the market. Some of these agents are sold as 'over-the-counter' products and have no professional involvement in their application  . A basic understanding of the elements of tooth colour is important for many aspects of restorative dentistry. Teeth are typically composed of a number of colours and a gradation of colour occurs in an individual tooth from the gingival margin to the incisal edge of the tooth. The gingival margin often has a darker appearance because of the close approximation of the dentine below the enamel. In most people canine teeth are darker than central and lateral incisors and younger people characteristically have lighter teeth, particularly in the primary dentition. Teeth become darker as a physiological age change; this may be partly caused by the laying down of secondary dentine, incorporation of extrinsic stains and gradual wear of enamel allowing a greater influence on colour of the underlying dentine. Also, and to be discussed further, tooth wear and gingival recession can directly or indirectly affect tooth colour  . The viewing conditions are extremely important and variables such as the light source, time of day, surrounding conditions and the angle the tooth is viewed from affect the apparent tooth colour. Light is composed of different wavelengths and the same tooth viewed under different conditions will exhibit a different colour, a phenomenon known as metamerism  . Tooth discolouration is usually described as extrinsic or intrinsic, based on the location of the stain  . Generalized intrinsic or permanent discolouration is indicative of a disruption of normal tooth development, whereas localized intrinsic staining of 1 or 2 teeth can occur before or after teeth have erupted  .Intrinsic discolourations occurs following a change to the structural composition or thickness of the dental hard tissues. The normal colour of teeth is determined by the blue, green and pink tints of the enamel and is reinforced by the yellow through to brown shades of dentine beneath. A number of metabolic diseases and systemic factors are known to affect the developing dentition and cause discolouration as a consequence. Local factors such as injury are also recognized. Nathoo type 3 (N3): N3-type colorless material or prechromogen binds to the tooth and undergoes a chemical reaction to cause a stain. N3-type stains are caused by carbohydrate-rich foods (eg, apples, potatoes), stannous fluoride, and chlorhexidine . Certain factors predispose children and adults to extrinsic stains, including enamel defects, salivary dysfunction, and poor oral hygiene. Microscopic pits, fissures, and defects in the outer surface of the enamel are susceptible to the accumulation of stain-producing food, beverages, tobacco, and other topical agents  . The saliva plays a major role in the physical removal of food debris and dental plaque from the outer and interproximal tooth surfaces, diminished salivary output contributes to extrinsic discoloration. Decreased output may be caused by local disease (eg, salivary obstructions and infections), systemic disease (eg, Sjögren syndrome), head and neck radiation therapy for cancer, chemotherapy, and multiple medications (eg, anticholinergics, antihypertensives, antipsychotics, antihistamines)  . 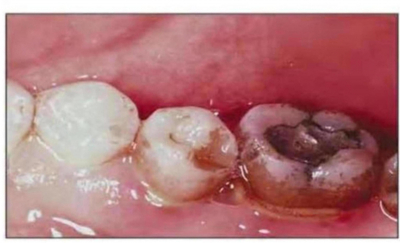 Deposition of tannins found in tea, coffee, and other beverages cause brown stains on the outer (buccal, labial) and inner (lingual, palatal) surfaces of the teeth. 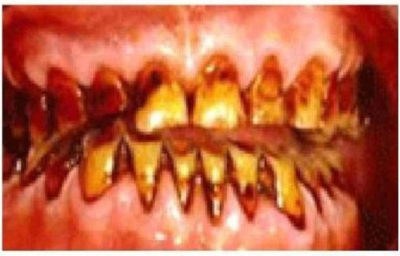 Tobacco stains from cigarettes, cigars, pipes, and chewing tobacco cause tenacious dark brown and black stains that cover the cervical one third to one half of the tooth (midway on the tooth toward the gingival margin).Pan (a combination of betel nut of the areca palm, betel leaf, and lime) is commonly chewed by more than 200 million persons in the western Pacific basin and South Asian region. It is used for its mild psychoactive and cholinergic effects, and it elicits a copious production of blood red saliva that results in a red-black stain on the teeth, gingiva, and oral mucosal surfaces  . Chromogenic bacteria cause stains, typically at the gingival margin of the tooth. The most common is a black stain caused by Actinomyces species. The stain is composed of ferric sulfide and is formed by the reaction between hydrogen sulfide produced by bacterial action and iron in the saliva and gingival exudates  . Green stains are attributed to fluorescent bacteria and fungi such as Penicillium and Aspergillus species  . The organisms grow only in light and therefore cause staining on the maxillary surface of the anterior teeth  . Dental stains can be attributed to many factors (Table 1). 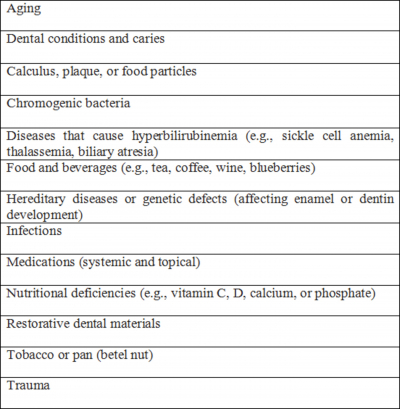 Although not common, some medications are associated with tooth discolouration (Table 2). Tooth discoloration is caused by multiple local and systemic conditions. Extrinsic dental stains are caused by predisposing factors and other factors such as dental plaque and calculus, foods and beverages, tobacco, chromogenic bacteria, metallic compounds, and topical medications. Intrinsic dental stains are caused by dental materials (e.g., tooth restorations), dental conditions and caries, trauma, infections, medications, nutritional deficiencies and other disorders (eg, complications of pregnancy, anemia and bleeding disorders, bile duct problems), and genetic defects and hereditary diseases (e.g., those affecting enamel and dentin development or maturation)  . Each tooth has an exposed portion or crown, root(s) that extend into the alveolar bone of the mandible or maxilla, and a neck where these 2 structures meet. The tooth is comprised of enamel, dentin, pulp, and cementum — the first 3 of these are found in the crown. Any structural changes involving the crown can affect the transmission and reflection of light by the tooth and result in a colour change. Enamel, the outermost exposed layer, is the hardest tissue in the human body and does not regenerate once the tooth has erupted and is fully formed. Normally, enamel consists of minerals (96%), water (2%), protein (1%), and other materials (1%). Any changes to these components can affect the strength and appearance of the enamel. The strength and resistance of enamel is due to the presence of crystallite formations consisting of carbonate-substituted hydroxyapatite molecules. Dental pulp is very specialized and has neurosensory and reparative functions. It consists of odontoblasts, fibroblasts, blood vessels, nerves, and an extracellular matrix  . A microscopically thin layer of salivary glycoproteins that coats the surface of the erupted tooth is known as the acquired pellicle  . The coating assists with lubrication, acid resistance, and remineralization, and can play a role in the adherence of chromogenic (or colour-producing) materials to the tooth’s surface. Teeth gradually darken as a person ages. Over time, the gradual loss of the enamel, the laying down of secondary dentin and the accumulation of stains contribute to the light-transmitting properties of the teeth  . The prevalence of tooth discolouration is unknown. While few drugs are linked to this adverse effect, most of those implicated are well known and well documented. As a result, preventative measures have made the occurrence relatively uncommon. However, US data indicated a rise in the incidence of mild-to-moderate fluorosis in the decade leading up to the year 2000  . Dental fluorosis occurs when excessive amounts of fluoride are ingested during the years of tooth development (i.e., birth to 8 years of age)  .luorine ions become incorporated into the enamel, leading to hypomineralization, increased porosity, and a mottled appearance  . 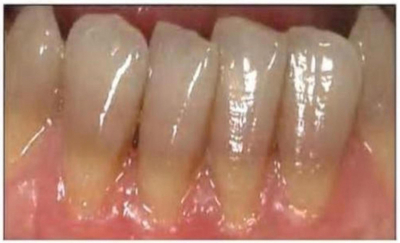 This dose-dependent effect ranges from mild, with horizontal opaque striations on the tooth surface, to more severe cases with dark stains and pitted enamel  . The degree of discolouration is related to the dose and duration of exposure to tetracycline  . It also occurs more frequently when cumulative doses exceed 3 g or the length of treatment extends beyond 10 days  . Newly erupted teeth will usually present with a bright yellow band  . On exposure to sunlight, the tetracycline crystals in the teeth undergo a photochemical reaction and gradually darken to a grey or red-brown colour  . Other tetracycline derivatives are associated with different colour changes. The semisynthetic tetracycline derivative, minocycline, is used in the long-term treatment of acne vulgaris, rosacea, rheumatoid arthritis, and periodontal disease. This drug has been known to cause generalized intrinsic green-grey or blue-grey staining in fully developed teeth. Tooth staining is experienced by 3%–6% of adult patients on long-term minocycline treatment at doses greater than 100 mg per day. Discolouration has been observed as early as one month, to many years, after the start of treatment  . Several theories of intrinsic and extrinsic processes have been proposed, but the mechanism for minocycline-induced staining is not fully understood  . Minocycline is more lipophilic than other tetracyclines and reaches gingival fluid concentrations that are 5 times those found in the serum  . The drug does not chelate calcium very well, but forms insoluble complexes with iron  . These salts may be incorporated into the secondary dentin (intrinsic) or stain the enamel when exuded from gingival fluid (extrinsic)  . Tigecycline, a glycylcycline tetracycline derivative, crosses the placenta and may cause permanent yellow, grey, or brown tooth discolouration if taken during the second and third trimesters  . A permanent greenish discolouration of new erupted teeth has been reported in infants who received intravenous ciprofloxacin 10 to 40 mg/kg/day for Klebsiella infection  . Extrinsic tooth staining is attributed to direct or indirect staining. Direct staining occurs when the colour of a chemical compound is incorporated into the acquired pellicle. This is often associated with chromogens found in dietary sources. Metal salts and cationic antiseptics cause indirect stains on the tooth’s surface due to a chemical reaction  . In either case, the stains can usually be removed by brushing or professional cleaning of the teeth  . In clinical trials, chlorhexidine produced tooth discolouration in over half of patients using the mouthwash or rinse for 6 months. Patients with a greater accumulation of dental plaque and patients who consumed greater quantities of chromogens (i.e., coffee, tea, red wine) experienced more staining. Discolouration was not related to the dose or drug concentration  . Long-term use of doxycycline for acne vulgaris and brucellosis has been associated with extrinsic tooth staining  . It is hypothesized that this agent binds to the glycoproteins of the dental pellicle, and in patients with poor oral hygiene, undergoes oxidation when exposed to sunlight or bacteria  . Linezolid was reported to cause a brown discolouration of the enamel on the lower front teeth of an 11-year-old girl who received a dose of 600 mg twice daily for 4 weeks. A dentist subsequently removed the stain by descaling  . Antimicrobial agents can cause pseudo-discolourations of the teeth. It is thought that they contribute to an overgrowth of chromogenic microorganisms or cause chromogenic precipitates in the pellicle  . Extrinsic tooth discolouration has usually been classified according to its origin, whether metallic or non-metallic  . The non-metallic extrinsic stains are adsorped onto tooth surface deposits such as plaque or the acquired pellicle. 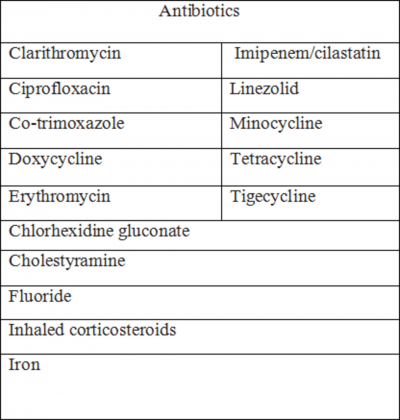 The possible aetiological agents include dietary components, beverages, tobacco, mouthrinses and other medicaments. Chromogenic bacteria have been cited in children. Particular colours of staining are said to be associated with certain mouths, for instance, green and orange in children with poor oral hygiene and black/brown stains in children with good oral hygiene and low caries experience. 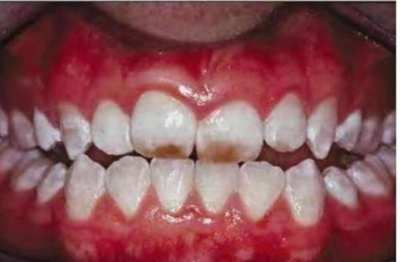 Conclusive evidence for the chromogenic bacterial mechanism has not been forthcoming.The most convincing evidence for the extrinsic method of tooth staining comes from the differing amount of stain found in a comparison of smokers and non-smokers. The staining effect of prolonged rinsing with chlorhexidine mouthrinses and quarternary ammonium compounds used in mouthrinses is of considerable interest to the dental profession  . Extrinsic staining of teeth may be associated with occupational exposure to metallic salts and with a number of medicines containing metal salts. The characteristic black staining of teeth in people using iron supplements and iron foundry workers is well documented. Copper causes a green stain in mouthrinses containing copper saltsand in workers in contact with the metal in industrial circumstances. A number of other metals have associated colours such as potassium permangenate producing a violet to black colour when used in mouthrinses; silver nitrate salt used in dentistry causes a grey colour, and stannous fluoride causes a golden brown discolouration. It was previously thought that the mechanism of stain production was related to the production of the sulphide salt of the particular metal involved. This is perhaps not surprising since the extrinsic stain coincided with the colour of the sulphide of the metal concerned. However, those proposing the hypothesis appeared not to consider the complexity of the chemical process necessary to produce a metal sulphide  . Dental treatment of tooth discoloration involves identifying the etiology and implementing therapy. Medical treatment also may be warranted, depending on the etiology of the tooth discoloration. Diet and habits: Extrinsic staining caused by foods, beverages, or habits (eg, smoking, chewing tobacco; see Causes and Pathophysiology) is treated with a thorough dental prophylaxis and cessation of dietary or other contributory habits to prevent further staining. Tooth brushing: Effective tooth brushing twice a day with a dentifrice helps to prevent extrinsic staining. Most dentifrices contain an abrasive, a detergent, and an antitartar agent. In addition, some dentifrices now contain tooth-whitening agents. Professional tooth cleaning: Some extrinsic stains may be removed with ultrasonic cleaning, rotary polishing with an abrasive prophylactic paste, or air-jet polishing with an abrasive powder. However, these modalities can lead to enamel removal; therefore, their repeated use is undesirable  . Enamel microabrasion: This technique involves the rotary application of a mixture of weak hydrochloric acid and silicon carbide particles in a water-soluble paste. The resultant surface is smooth and has a glazed appearance. Enamel microabrasion is indicated for the removal of superficial intrinsic tooth discoloration, including that caused by fluorosis and decalcifications secondary to orthodontic brackets or bands. Enamel microabrasion may be used in conjunction with bleaching  . Teeth discolored by dental caries or dental materials require the removal of the caries or restorative materials, followed by proper restoration of the tooth. Partial (e.g., laminate veneers or full-coverage dental restorations may be used to treat generalized intrinsic tooth discoloration in which bleaching is not indicated or in which the aesthetic results of bleaching fail to meet the patient's expectations. Patients with severe dental involvement may be candidates for extractions; after which either partial or complete removable dentures or osseointegrated implant-borne prostheses can be used. Patients with genetic defects in the formation of enamel or dentin present with a wide range of clinical manifestations. In some patients with severe AI or DI, extractions may be required; after which removable dentures or implant-borne prostheses can be used. Recommend that all patients perform daily oral hygiene by using a toothbrush, a dentifrice, and dental floss. Individuals who wear dentures should brush the prostheses after each meal and use commercially available denture soaks and scrubs to keep the prostheses free of plaque, calculus, and stains. Educate patients about the necessity of daily oral hygiene and about the medications implicated in dental discoloration. Educate patients who are treated for medical disorders associated with dental discoloration about the risks of tooth-related disorders. Drug-induced tooth discolouration is rare and prevention remains the key to minimizing the physical and psychological trauma associated with it. Knowledge of the aetiology of tooth staining is of importance to dental surgeons in order to enable a correct diagnosis to be made when examining a discoloured dentition and allows the dental practitioner to explain to the patient the exact nature of the condition. In some instances, the mechanism of staining may have an effect on the outcome of treatment and influence the treatment options the dentist will be able to offer to patients.When recommending or prescribing oral care products known to cause staining, it is important to warn patients of such potential side effects. In understanding the mechanism of stain formation associated with cationic antiseptics and metal salts, notably stannous fluoride, advising patients in respect of the more chromogenic dietary fluids may help prevent or limit tooth staining. 1. Watts A, Addy M. Tooth discolouration and staining: a review of the literature. Br Dent J 200; 190:309-16. 2. Tredwin CJ, Scully C, Bagan-Sebastian JV. Drug-induced disorders of the teeth. J Dent Res 2005; 84(7):596-602. 4. Nathoo SA. The chemistry and mechanisms of extrinsic and intrinsic discoloration. J Am Dent Assoc 1997 Apr; 128 Suppl: 6S-10S. 5. Hattab FN, Qudeimat MA, Al-Rimawi HS. Dental discoloration: an overview. J Esthet Dent 1999; 11(6): 291-310. 6. Norton SA. Betel: consumption and consequences. J Am Acad Dermatol 1998 Jan; 38(1): 81-8. 7. Reid JS, Beeley JA, MacDonald DG: Investigations into black extrinsic tooth stain. J Dent Res 1977 Aug; 56(8): 895-9. 8. Rajkumar. Tooth-teeth discolouration. [online] [cited 2007 October 29.] Available from URL:www.dentalmumbai.com. 9. Wright JT. Anatomy and development of the teeth. Up-To-Date [electronic database]. Rose BD, editor. Waltham (MA); 2007. 10. Spraycar M, editor. Stedman’s Medical Dictionary. 26th ed. Baltimore (MD): Williams and Wilkins; 1995. 11. McEvoy GK, editor. AHFS Drug Information. Bethesda (MD): American Society of Health-System Pharmacists, Inc.; 2007. 12. Livingston HM, Dellinger TM. Intrinsic staining of teeth secondary to tetracycline. Ann Pharmacother 1998; 32:607. 13. Dodd MA, Dole EJ, Troutman WG, et al. Minocycline-associated tooth staining. Ann Pharmacother 1998; 32:887-9. 14. Good ML, Hussey DL. Minocycline: stain devil? Br J Dermatol 2003; 149(2):237- 9. 15. Nelson R, Parker SRS. Doxycycline-induced staining of adult teeth: the first reported case [letter]. Arch Dermatol 2006;142(8):1081-2. 16. Ayaslioglu E, Erkek E, Oba AA, et al. Doxycycline-induced staining of permanent adult dentition. Aust Dent J 2005; 50(4):273-5. 17. Matson KL, Miller SE. Tooth discoloration after treatment with linezolid. Pharmacotherapy 2003; 23(5):682-5. 18. Croll TP: Enamel microabrasion: observations after 10 years. J Am Dent Assoc 1997 Apr; 128 Suppl: 45S-50S. 19. Reactions Database 1983-2007/03. WebSPIRS Version 5.12. Ovid Technologies.